Heat oven to 350°F (325°F for dark or nonstick pan). Make and bake cake as directed on box for 13x9-inch pan. Cool 10 minutes. Run knife around sides of pan to loosen cake; remove from pan to cooling rack. Cool completely, about 1 hour. Place cake, bottom side up, on large platter or foil-covered cookie sheet. Remove 2 tablespoons of white frosting from container; set aside. Remove one-third of the frosting (about 1/2 cup) to small bowl. Tint black; set aside. Tint remaining frosting neon green. Frost sides and top of cake with neon green frosting. Using picture as a guide, use decorating icing with a round tip to outline hair. Add licorice pieces for eyebrows. Use reserved white frosting to form eyes. 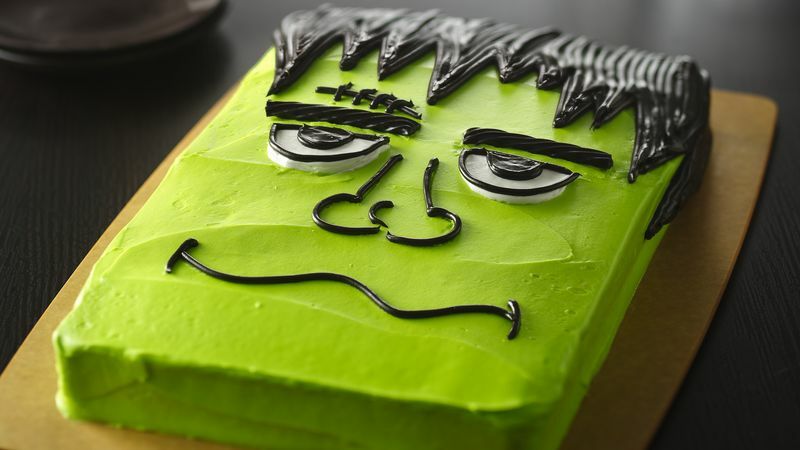 Use icing to outline remaining facial features. Spread black frosting within the outlines to fill in the hair. Store loosely covered. To remove cake from pan, place cooling rack over pan. Carefully turn over; lift off pan. Use 2 white candy melts or coating wafers instead of frosting to make the white part of the eyes.